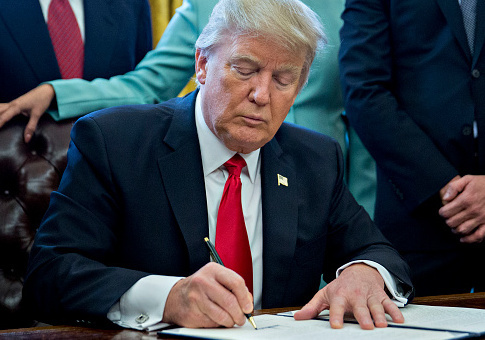 President Donald Trump put welfare reform front-and-center Tuesday evening, signing an executive order to begin a review of federal welfare programs to ensure that they promote helping dependents out of poverty. The order outlines key principles to shape welfare in the coming months. These include encouraging economic independence; supporting marriage and family; providing more flexibility to the states; and streamlining services. To implement these principles to the extent the executive branch is able, the order focuses primarily on enforcing and expanding work requirements associated with current federal welfare programs. At present, that means few concrete changes, but Trump has now instructed a number of his cabinet secretaries to review preexisting regulations and programs to ensure that they comport with the administration's goals. The order is part of the administration's current focus on reforming federal welfare programs. The White House announced in January it plans to help states implement work requirements for Medicaid. And in February, the U.S. Department of Agriculture began soliciting comment on changes to the Supplemental Nutrition Assistance Program (SNAP). Concurrent congressional action, likely in the form of changes to SNAP's work requirements, is expected in the near future. Able-bodied adults' enrollment in welfare programs is at record highs, according to the administration. Over 74 million Americans are enrolled in Medicaid and associated programs, up 23 percent from 2013. 42 million Americans are enrolled in SNAP, a decline from 2011 highs during the Great Recession, but a 26 percent increase compared to 2006. Federal welfare rolls are also filled with individuals who might otherwise be working. Twenty-eight million able-bodied adults are enrolled in Medicaid, a number that has quadrupled since 2000. Some 16 million able-bodied adults are enrolled in SNAP, but only 3.8 million are subject to expanded work requirements, according to official estimates. A recent study estimated that, thanks to the enrollment of large numbers of able-bodied adults in Medicaid under Obamacare’s expansion, some 21,000 people have died waiting to get off waiting lists. At the same time, unemployment rates remain at record lows. A January report from the Federal Reserve found that American businesses are struggling to find workers. Both of these facts indicate strong job market prospects for welfare-enrolled adults who could be working. Closing the gap between employable welfare recipients and companies seeking workers will likely be the major priority of the administration and congressional Republicans in coming months. Information provided by the White House noted that many states have already seen success with work requirements: Kansas saw a 75 percent decline in case load and a 50 percent decline in time spent on welfare after it implemented work requirements for able-bodied, childless adults on food stamps. With the backing of the Trump administration, many states are seeking to expand work requirements in their welfare programs. Kentucky has attracted significant attention for adding work requirements for able-bodied recipients of Medicaid. Indiana and Arkansas have also received federal approval to add work requirements to their programs; several other states are exploring or planning to implement similar such expectations. This entry was posted in Issues and tagged Medicaid, SNAP, Trump Administration, Welfare. Bookmark the permalink.